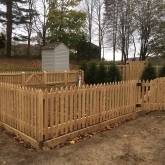 Roots Landscaping is here to service all of your fencing needs in Redding Ridge, CT. Our experienced team has completed a large assortment of varied projects. You have probably even seen some of our work while driving around Redding Ridge. We are ready to take on any challenge you have for us. 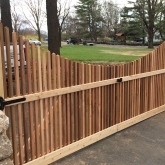 Roots Landscaping is a member of the American Fence Association, and we are equipped to find the perfect fence for you. It is our goal to provide Redding Ridge with outstanding service and products. 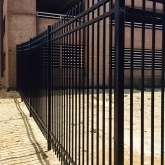 Since there are many types of fences, it’s important to know why you would want a fence in the first place. It may be for added protection, noise cancellation, or a multitude of other reasons. We are ready to help Redding Ridge citizens bring their business or household fence ideas to life. 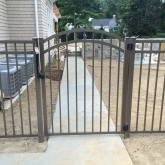 Fence installation can be a difficult and dangerous process. That is why Roots Landscaping is here to provide Redding Ridge residents with safe, hassle free installation. Roots Landscaping will begin by having a discussion about the type of fence that best meets your needs. Then our staff will analyze your property’s size and terrain. 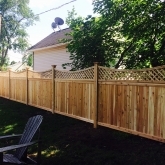 The cost is going to depend on the specific characteristics of your fence: Height, Length, and Material. It can be hard to know how to care for an old or damaged fence. That’s where Roots Landscaping comes in. Our experienced staff is here to detect any and all problems with your fence, and the proper repair steps that should be taken. One of the most frequent problems we see with fences is wood rot, which is caused by fungi that eat the actual wood. This often calls for professional care: chemical treatments, patching, repainting, and/or staining. When wood rot has reached an advanced stage, there may be no repairing it. In that case, we must replace your fence. Roots Landscaping is Redding Ridge’s contractor for all wood fence repairs and replacements. Taking care of your fence poles is an important part of maintaining a long-lasting fence. If poles shift in the ground or are damaged, they must be fixed. Otherwise, the entire fence may deteriorate. Roots Landscaping can take care of all your fence pole problems, and help ensure the integrity of your fence. If you live in Redding Ridge, CT, and you are experiencing wood rot, contact us today! 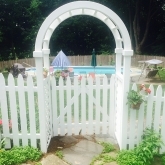 Roots Landscaping can repair any holes or cracks your fence in Redding Ridge, CT, may have. The type of fence you have will determine the type of repairs you will need. It is important that all holes and cracks are tended to in order to preserve your fence. Missing boards can cause big problems for your fence. It is important to fix them right away. 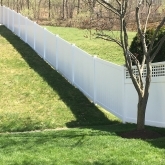 If you fail to replace missing boards your entire fence may collapse. Replacing missing boards is a cheaper process than fixing an entirely collapsed fence. This is a common type of repair that Roots Landscaping can do for you! 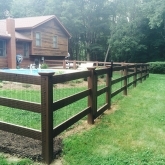 Contact us today if you live in Redding Ridge, CT, and need fence boards replaced. Roots Landscaping is proudly accredited by the BBB standards. For more information or assistance reach out today! We are happy to answer questions and explain our services further. Call us now at 203-702-4408. Send us your project requirements. We would be happy to assist you!